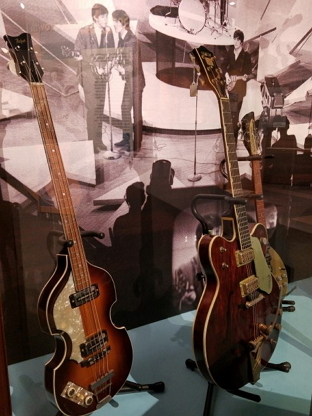 The Guitar Storage staff took a road trip to beautiful Carlsbad California to visit the NAMM Museum of Making Music. You’ll be surprised at how much great stuff is there and will end up spending a lot more time than you thought. 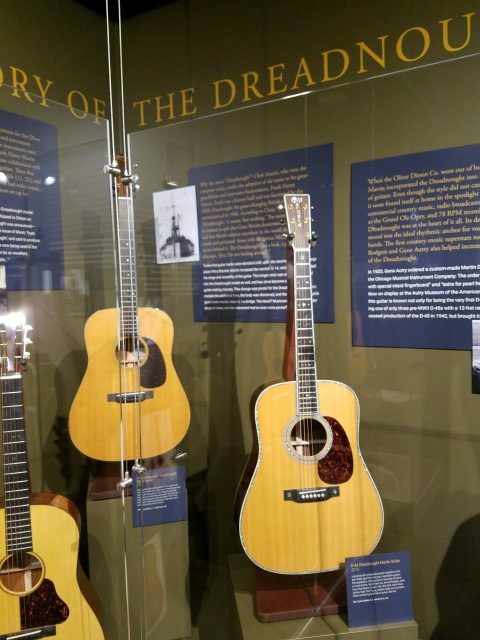 In addition to all types of other instruments and a history of Music Stores, there’s plenty of exhibits to keep a guitar player happy. There’s Beatles and Elvis gear plus plenty of other interesting guitars like this Double-neck Bigsby as well as other historical exhibits. A great stop is the Innovation Center. You can try out a number of different instruments including a Rickenbacker as well as a Theramin, which was a lot of fun. Their current Special Exhibit, running until 4/30/2017 is “Dreadnought: 100 Years of a Mighty Martin Guitar”. You can see a number of famous ones as well as a history of the Dreadnought. Better yet, you can play some. We thank the museum for choosing our Carousel Multi-guitar stand to hold these great Martin Guitars for you to try. Make sure you save some time to browse around a great museum store. If you’re in the Carlsbad, CA area, visit this fantastic gem of a museum at 5790 Armada Dr, Carlsbad, CA 92008.